International award-winning Montana author from Stevensville, Diane Hipp, has issued a “new” book aimed at children on the subject of bullying – titled “Hermis and Howard: A Bully Finds His Heart”. “Bullying is a problem that reaches into our cultures, communities, schools, peer groups and families, the extent of which will vary across different schools and communities,” author Hipp said upon the release of her book by Stoneydale Press of Stevensville. This is the second in a series of self-help books for children written by Ms. Hipp. Her first book in this series, “Stuart The Donkey: A Tale of His Tail,” won the 2010 Children’s Fiction Book of the Year and received a 2011 International Children’s Book Award. Ms. Hipp also is the co-author of the highly acclaimed conflict management curriculum “Kelso’s Choice” that is being implemented in thousands of schools across the United States and in 13 other countries. Hipp’s new book was inspired by bullying events that are occurring throughout schools and communities across the country. What makes this book unique is the approach to the topic of bullying prevention. The book supports what we know through bullying research on how to intervene when bullying occurs, through the use of an imaginative and intriguing story. 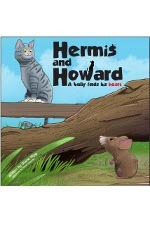 Hermis is a shy and timid mouse that is bullied by a lonely cat named Howard. Three of Hermis’ friends come to his rescue and teach him a valuable lesson on dealing with bullies. The illustrations for Ms. Hipp’s book were done by artist Steve Harpster of Blue Ash, Ohio. Diane Hipp dedicates her life to identifying and building the potential in others. She can be found in schools across the country helping to foster a positive school climate. At her home, which is nestled between the Bitterroot River and the Bitterroot Mountains in western Montana, she immerses herself in the world of nature where wildlife abounds. Diane spends hours hiking, observing, photographing and taking notes of the many lessons nature has to offer. Her stories capture the essence of the moment in hopes that the reader gains an appreciation of the natural world and how it releases to life’s lessons for young and old. Issued in full-color format, 8½ by 8½ inches in size, 52 pages, softcover format, fully illustrated.